[Jan 8th continued from page 141] on Wed. I am so sorry. [Jan ]16th Annie Willett, Amelia Williams & Beckie Townsend (d[ied] 1926) spent evening with Maggie Mumford. [Jan ]20th Cut out my wedding dress. [Jan ]24th Sick with hay fever. [Jan ]27th Went to Aunt Margaret[']s & told her I was to be married on Wednesday. Sally came over & helped me make a cake. Sent to Snow Hill for my wedding Cake. [Jan ]29th We were married & took the stage for Laurel[,] Del. Sallie & Annie my bridesmaids with Dan & Moddie as groomsmen. Mr Quinn the minister[.] We left a [sic] 8.30 taking Louise to Mr Cannon[']s to see her sister. We took the train at Laurel [and] arrived at Phila at 10 P. M. Stopped at La Pierre House. 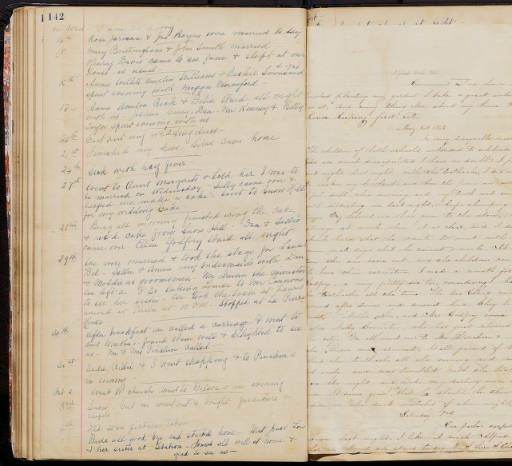 [Jan ]30th After breakfast we called a carriage & went to Aunt Martha's, found them well & delighted to see us. Mr & Mrs Pinchin called. [Jan ]31st Sadie, Billie & I went shopping & to Pinchin's in evening. [Feb ]3rd Snow, but we went out & bought furniture & carpets. [Feb ]5th Bade all good bye and started home. Met Jones[,] Lou & her sister at Station. Found all well at home & glad to see us. April 16th 1862. Commenced raising our house to-day. Finished planting my garden. I take a great interest in it, and every thing else, about my house. I like house-keeping first-rate. May 1st 1862 A rainy, disagreeable morning. The children of both schools, intended to celebrate to-day and are much disappointed I have no doubt. I passed a quiet night last night with the toothache. I did not wish to awaken my husband, and bore the pain in silence. I feel dull this morning and my tooth not content with disturbing me last night, keeps thumping all the time. My beloved one has gone to the store, he is always at work when it is clear, and I do not think hard that he wants to meet with the men such days that he cannot work. At noon time the sun came out, and the children concluded to have their coronation. I made a wreath for Ellen Godfrey, a very pretty one too, considering I had the toothache all the time. The two Ellen's [sic] came around after dinner and dressed here. They look very sweet. Mother, a Son, and Mrs Godfrey came and also Nelly Covington, who has just returned from the city. We all went over to Mr Derickson's, where the Queen was crowned. It all passed of[f] beautifully. Had the toothache all the evening and went to bed early, and was troubled with the toothache in the night, and woke my darling more than once. It seems queer yet that he should be there by my side in the dark watches of the night. 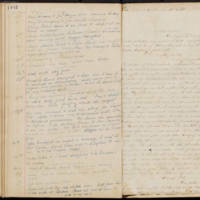 Warrington, Emily Ann Powell, “Powell Diary, 1846-1862 (pages 142-143),” Nabb Research Center Online, accessed April 21, 2019, https://libapps.salisbury.edu/nabb-online/items/show/267.